Although Samsung was largely expected to kick off the display hole trend, recent teasers have suggested that Huawei will beat its South Korean rival to market. And today, just days after Huawei’s first offering leaked, the Nova 4 has shown up again in a new set of images that provide a much clearer look. 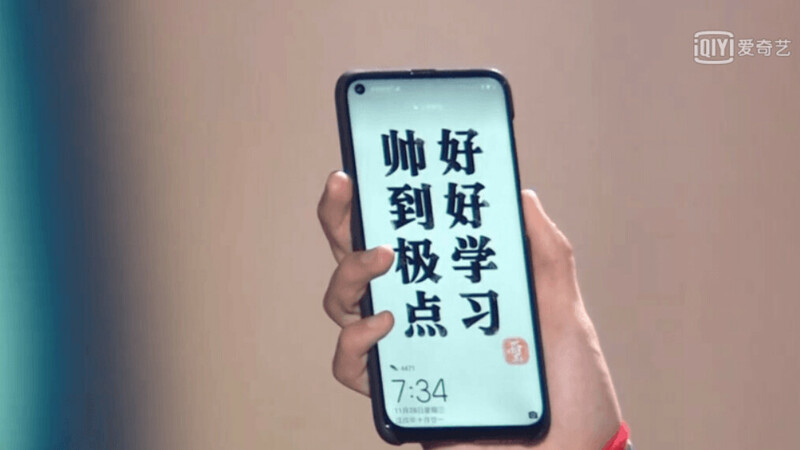 At an event held in celebration of Chinese singer Jackson Yee’s 18th birthday, Huawei chose to show off its upcoming smartphone for a brief moment. Just as expected, the Nova 4 makes use of a small camera hole in the top-left corner of the display which subsequently removes the need for a notch, thus allowing a significantly smaller bezel. However, following in the footsteps of most 2018 smartphones, a chin beneath the display is still visible. The rear design of Huawei’s Nova 4 is currently unconfirmed but is expected to resemble the Huawei P20 Pro. Elsewhere, these particular images do point towards a bottom-firing speaker and a USB Type-C port. Furthermore, the images that leaked a few days ago revealed the presence of a headphone jack on top of the device. The Huawei Nova 4 is currently expected to go official in China on December 12. Shortly after this, a release is expected to take place in the market. However, when it comes to international, this probably won’t happen until early 2019. So, they say "imitation is the most sincerest form of flattery" are they saying that Samsung has the right display design going forward and that notches are no longer viable and if so are they also conceding that Samsung is the leader to, now, imitate? So let me get this straight. You believe that Huawei was able to create a smartphone within a month's time that copied Samsung? The first news article that pointed to a hole-punch style display on a Samsung device was about November 13th. That's awfully quick of Huawei to create a production device like that. But wasn't there another phone that had this design around the time of the first generation iPhone x. It was either sharp or Vivo, it was a corner notch (so not quite this design). People said it was a horrible design choice. I think a small notch or hole is an excellent transition design before we reach the true bezel and hole free front. yeah, because O,U,V is so much better to pronounce than screen cut out....originality from past. whatever it is looking good. The hole will be annoying when playing some games as the controls are in the bottom corners on some games. prefer the notch. Doesn't notch block more content/controls on screen? id rather have a hole than a notch which covers a whole block of screen. I'm first to admit that Huawei copies voraciously like most chinese OEMs but for them to launch a hole in display phone so quickly suggests it was probably in the pipeline and I imagine manufacturing took speed once rumours broke of Samsung uitlizing a hole display. Both companies have had patents since early this year. Why not just put the camera in the top right corner and move the time to the centre of the status bar?